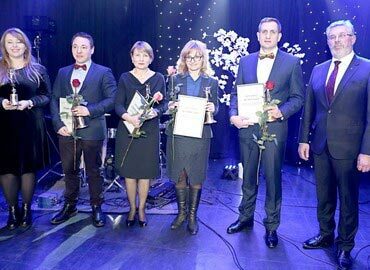 The ceremony of awarding the best companies in the region in 2016 was organized by Vilnius Chamber of Commerce, Industry and Crafts (Vilnius CCIC) on December 8. As the result of competition, Lithuanian company of RETAL was included in the winners list. Vilnius CCIC is the largest Chamber of Commerce in Lithuania. Management of this organization brings together its members annually to summarize the outcome, and encourages the best representatives of the business community who have made the greatest contribution to the development of the region and the country’s economy. This year, UAB RETAL Lithuania has been recognized as the best export-oriented com-pany in the region. The company has successfully been producing PET preforms in Lith-uania since 1997, and it involves about 200 employees in the modern plant in Lentvaris. The traditional award of CCIC, the statuette of the Roman god of trade, Mercury, was presented to Giedrius Viederis, the General Director of UAB Retal Lithuaina, in the presence of Evaldas Gustas, Minister of Economy in Lithuania, Šarūnas Kliokys, Association of Lithuania Chambers of Commerce, Industry and Crafts president, Dr. Almantas Danileviči-us, CCIC president, Vilnius authorities representatives, and top management of leading companies in the region. The jury members, CCIC management and distinguished guests paid tribute to the successful annual performance of UAB Retal Lithuania export and to the importance of pres-ence in the region a major manufacturer of modern and technologically advanced con-tainers and packaging.